How to Select Waterproof Fiber Optic Patch Cable? Fiber optic waterproof cables are widely used in outdoor applications to connect the major fiber optic lines or receivers or splice enclosures. According to different requirements, both fiber optic patch cords and fiber optic pigtails are available. Water proof fiber cable usually adds a water blocking material between the outer jacket and the inner fiber (or inner jacket) to protect the fiber surface from unwanted damage, such as an armored cable or loose-tube gel-filled cable, or water-tolerable tight-buffered cable. Since there are different types of structure for waterproof cables, is there an easy way to determine which waterproof fiber optic patch cable to choose? In order to help select a right waterproof fiber optic cable quickly, this post will introduce the basic knowledge of waterproof ratings and the features of our waterproof fiber optic cable. How Is a Waterproof Cable Rated? Like choosing any other fiber optic patch cables, the connector type, fiber count, fiber type (single-mode or multimode), polish type, cable length and cable jacket are factors that should be considered as well. When buying waterproof fiber optic patch cords, the IP (International Protection or Ingress Protection) rating is an important parameter. 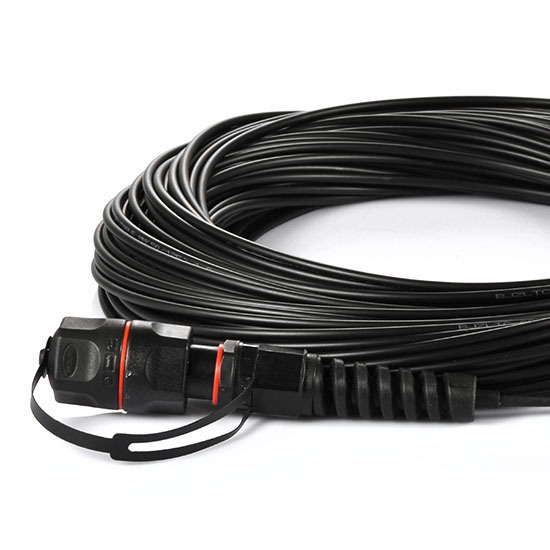 Knowing the IP code can help you find your wanted waterproof cable. IP rating system is a classification showing the degrees of protection from solid objects and liquids. IP rating codes do not include hyphens or spaces, and consist of the letters IP followed by one or two figures. The first number refers to the degree of protection against the entry of foreign solid objects, such as dust. These protection levels range from 0 to 6. The second number of the IP code refers to the degrees of protection against moisture/liquids, which are raging from 0 to 8. The first and second number of the IP code can be replaced by the letter “X” when the protection capacity against solid objects (the first number) or moisture (the second number) has not been tested, for example, IPX7 and IP6X. The following two tables explain the two types of protection levels in details. Table 1: Protection levels against solid objects. 1 Protection from contact with any large surface of the body, such as the back of a hand, but no protection against deliberate contact with a body part, such as a finger. Less than 50mm. 2 Protection from fingers or similar objects. Less than 12.5mm. 3 Protection from tools, thick wires or similar objects. Less than 2.5mm. 4 Protection from most wires, screws or similar objects. Less than 1mm. Table 2: Protection levels against moisture. 1 Protection against vertically dripping water. 10 mins Light rain. 2 Protection against vertically dripping water when device is tilted at an angle up to 15 degrees. 10 mins Light rain. 3 Protection against direct sprays of water when device is tilted at an angle up to 60 degrees. 5 mins Rain and spraying. 4 Protection from sprays and splashing of water in all directions. 5 mins Rain, spraying and splashing. 5 Protection from low-pressure water projected from a nozzle with a 6.3mm diameter opening in any direction. 3 mins from a distance of 3 meters Rain, splashing and direct contact with most kitchen/bathroom faucets. 6 Protection from water projected in powerful jets from a nozzle with a 12.5mm diameter opening in any direction. 3 mins from a distance of 3 meters Rain, splashing, direct contact with kitchen/bathroom faucets, outdoor use in rough sea conditions. 7 Protected from immersion in water with a depth of up to 1 meter (or 3.3 feet) for up to 30 mins. 30 mins Rain, splashing and accidental submersion. 8 Protected from immersion in water with a depth of more than 1 meter (manufacturer must specify exact depth). Varies Rain, splashing and accidental submersion. FS.COM provides IP67 waterproof fiber optic patch cable, including simplex, duplex, 12 fibers, 24 fibers, and various kinds of connect interfaces are optional, such as LC-LC fiber patch cord, SC-SC fiber patch cord, MPO-MPO fiber patch cord, etc. Other degrees of waterproof fiber optic patch cords can also be customized. Our waterproof fiber patch cables are designed with strong PU jacket and armored structure, which can resist high temperature and fit for harsh environment. Our IP67 waterproof fiber patch cords are featured with high temperature stability and low insertion loss. It is also very convenient to install these waterproof, dust-proof and corrosion-resistant patch cords. The plug and socket design can be used to extend the cable length. They are very suitable for FTTH (fiber to the home) and LAN (local area network) applications. The IP code for waterproof devices is not that difficult to understand and you can get some basic information about the protection degree of a device after you know the meaning of each number. You can use it as a reference in choosing a waterproof cable, but you should also consider other factors according to your specific applications.